If you are stopping by, it is best to make an appointment as our office hours are limited and varied. Because we are located at Land Title's Office Building, we are able to have booklets, medals, t-shirts, etc set aside at the reception desk with prior arrangements. As we continue to work on growing the games, the Wisconsin Senior Olympics has expanded their team. Just a short three years ago, the WSO team consisted of a very part-time Games Coordinator and Registration Assistant and then we moved to having a part-time Executive Director, Mollie Bartelt. Since then, with the increase in athletes each year as well as sponsors who are supporting the games, we now have a team of people who are helping behind the scenes. 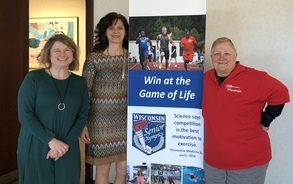 From left to right, Mollie Bartelt, Executive Director; Yvonne Lewandowski, Associate Director/Registration Coordinator and Judy Grzegorski, Games Coordinator. While our team does work part time and limited hours, we generally are able to respond to emails and calls within a business day or two. Judy Grzegorski, Games Coordinator - Judy works with the Event Coordinators, Games Committee and Booklet Committee to ensure the games are scheduled and run fair and within the NSGA official sport rules. Please contact Judy with general questions about the games and if you have any concerns about rules, format, etc. Yvonne Lewandowski, Associate Director/Registration Coordinator - Yvonne works with athletes, donors, sponsors, community relations and much more to help spread the word about the games. In addition, she handles all registration questions and data entry as well as bookkeeping for the WSO. Let Yvonne know if you have a great marketing idea or need assistance with registration or result change. Mollie Bartelt, Executive Director - Mollie works with current sponsors, WSO ambassadors, volunteers and athletes to help share the stories of the games to also create greater awareness around the state. Contact Mollie if you have suggestions for people to feature in our Humana Hero Athlete of the Month articles or for WSO ambassador and volunteer questions.